Every September, successful New York businessman Robert L. Talbot visits his Italian villa to relax and to romance his Roman girlfriend. But after arriving unannounced one July day, he is in for a huge surprise. During his annual absence, the luxurious home becomes a luxurious hotel, run by the staff for their financial gain. What's more, the current guest list accommodates a gaggle of American girls with persistent boys pining after them. In a desperate attempt to regain control, Talbot manages to lose his privacy, his girlfriend and his mind - until he comes up with a plan of his own. A stylish, romantic and racy romp, COME SEPTEMBER is a shining example of the many comedies made by Rock Hudson in the 1960s and also marked the film debut of Bobby Darin, who also ended up marrying his co-star, Sandra Dee, just ten days after filming wrapped. 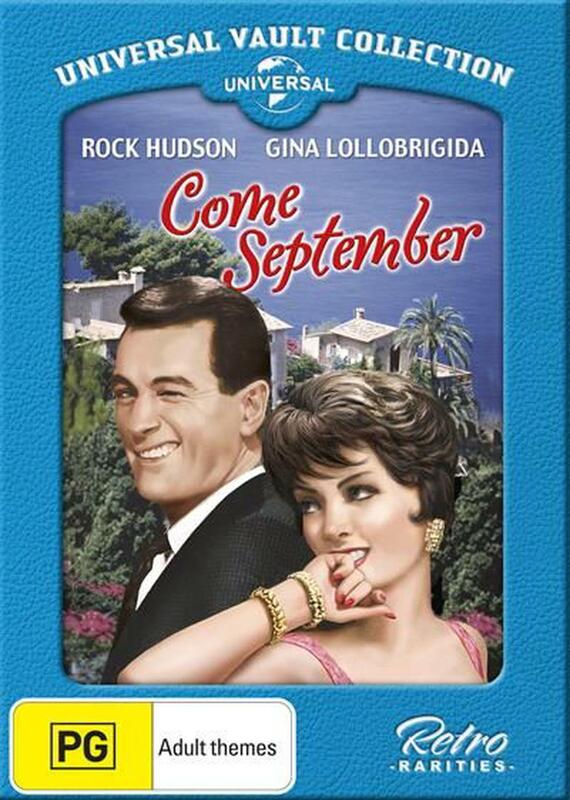 COME SEPTEMBER is beautifully shot on the Italian Riviera by Greta Garbo's favourite cinematographer, William Davis, with designer Morton Haack creating Ms. Lollobrigida's exquisite gowns.